1. Taisia Bekbulatova and Viktor Khamraev article headlined "Sergei Sobyanin to repeat Moscow" looks at the inauguration of Mayor Sergei Sobyanin; pp 1, 3 (1,015 words). 2. Vladislav Novy article headlined "Apple gets Russian wholesale trade" says that Apple Corporation has chosen two new distributors in Russia: Merlion and diHouse; pp 1, 10 (570 words). 3. Oleg Rubnikovich et al. report headlined "Hermitage does not pass police acceptance" says that several searches have been conducted in Moscow and St. Petersburg as part of the case of embezzlement of budget funds allocated for the refurbishment of one of the Hermitage buildings; pp 1, 4 (643 words). 4. Petr Netreba and Dmitry Butrin article headlined "Money being washed away right before your eyes" says that the discussion about the reduction of budget expenditures in 2014 has been postponed for at least a week. Meanwhile, the current 2013 budget expenditures may be curtailed too as quite a big amount of money is required to eliminate the consequences of the flooding in the Far East; pp 1-2 (938 words). 5.Dmitry Butrin article headlined "Abu-Dhabi builds its bridge to the Kremlin" says that the Abu-Dhabi Emirate is going to invest up to $5 billion in Russian infrastructure. The investment of the United Arab Emirates as well as that of the Persian Gulf countries aims to make Russia's policy towards the key problems of the region, including Syria, more moderate, experts comment; p 2 (555 words). 6. Maxim Ivanov article headlined "Sociologists study their miscalculations" says that after failure to forecast the outcome of the Moscow mayoral election, sociologists are trying to discover the reason behind the low voters turnout. Meanwhile, the Central Elections Commission plans to check campaigning in social networks and raising money via internet purses, the tools employed by protest leader Alexei Navalny; p 3 (650 words). 7. Vladislav Trifonov article headlined "Sergei Polonsky finds passport" says that businessman Sergei Polonsky, who is on the international wanted list on suspicion of stealing 3.2 billion rubles from private investors in Russia, has obtained Cambodian citizenship ; p 4 (471 words). 8. Maria Yefimova article headlined "Turkish revolution going around" says that a new wave of protests has swept over Turkey over the death of a young activist, and features a Russian political analyst's comment; p 5 (539 words). 9. Yelena Chernenko article headlined "SCO to act as single Syrian front" says that today the participants in the Shanghai Cooperation Organization (SCO) summit in Bishkek are to adopt a joint statement condemning a possible military intervention in Syria; p 5 (638 words). 10. Pavel Tarasenko article headlined "West measures eastern pressure" says that the State Duma has labelled as politically motivated the resolution of the European Parliament which condemns Russia for exerting pressure on the countries of the Eastern Partnership; p 5 (7233 words). 11. Yelizaveta Kuznetsova article headlined "Dmitry Kamenshchik takes Domodedovo upon himself" says that under pressure from the state, Domodedovo airport has named Dmitry Kamenshchik as its beneficiary. Experts wonder if the revealed information will satisfy the state officials who are to decide on the allocation of state financing to the airport; p 7 (557 words). 12. Anna Solodovnikova article headlined "Zarubezhneft finds way to Iran" says that Zarubezhneft has become the first Russian oil company to obtain the right to work in Iran. The project looks purely political as there are no channels of gas sale available at present; p 9 (458 words). 1. Alexei Gorbachev article headlined "Bolotnaya [Square] defendants drowning in charges" says that law enforcers continue to testify against the defendants in the case of disorders in Moscow on May 6 2013, keeping up the charges; pp 1-2 (540 words). 2. Alexandra Samarina article headlined "TV and internet divide electorate" says that the Liberal Democratic Party of Russia is drafting a bill to make live televised debates obligatory for candidates running in elections; pp 1, 3 (901 words). 3. Sergei Kulikov article headlined "Privatization plan fulfilled by 4 percent" says that the government is seeking ways to cut budget expenditures with investment being the most probable target. Experts warn the move will result in the slowdown of the economic growth; pp 1, 4 (599 words). 4. Sokhbet Mamedov article headlined "Baku and Washington sort out relations" says that the visit of a U.S. delegation, headed by Deputy Assistant Secretary of State in the Bureau of Democracy, Human Rights and Labour at the U.S. Department of State Thomas Melia to Azerbaijan, has been cancelled as Baku is unwilling to deal with the diplomat; pp 1, 7 (389 words). 5. Tatyana Ivzhenko article headlined "Germany takes root on Ukrainian gas market" says that next week, the German company RWE will begin to pump gas to Ukrainian gas storage facilities and looks at the conflict unfolding between Kiev and the Russian gas monopoly Gazprom; pp 1, 7 (1,007 words). 6. Yevgenia Novikova article headlined "Syria gets down to disarmament" says that at a summit in Switzerland, the Russian and U.S. foreign ministers are discussing the Russian initiative to place Syrian chemical weapons under international control; pp 1, 6 (662 words). 7. Editorial headlined "New political reality for ruling party" says that the Moscow mayoral election has been marked by the low voters turnout. The authorities not using their main propaganda resource, television, is given as the main reason behind the low turnout; p 2 (482 words). 8. Oleg Vladykin article headlined "Ukraine delays Smetlivy" says that the Ukrainian customs did its best to delay the departure of the Russian patrol vessel Smetlivy heading for the Mediterranean. The move may have been prompted by a recent toughening of control on the borders of the customs union; p 2 (309 words). 9. Alexander Knyazev article headlined "Carte blanche. China laying hands on SCO" says that judging by the results of the Chinese leader's visits to Central Asian countries, Beijing is striving to establish control over the region; p 3 (749 words). 10. Ivan Rodin and Alexandra Samarina article headlined "Country attractive for laborers" says that the State Duma is to look at toughening the migration law today. Meanwhile, the UN report shows that Russia ranks second in the rating of countries with the biggest number of migrants; p 3 (1,051 words). 11. Igor Naumov and Mikhail Sergeyev article headlined "Royal prince to build central ring motorway" says that the UAE will invest up to $5 billion in Russian infrastructure projects in a deal between the Russian Direct Investment Fund (RDIF) and the Abu Dhabi Department of Finance; p 4 (648 words). 12. Sergei Turanov article headlined "Russia's best lobbyists in August 2013" features a rating of the most efficient and influential representatives of commercial, state structures and lawmakers lobbying projects in the interests of certain structures, industries, regions or society layers; p 5 (1,386 words). 13. Grigory Mikhailov article headlined "Nine presidents gather in Bishkek" looks ahead at the 13th summit of the Shanghai Cooperation Organization to open in Kyrgyzstan today; p 7 (511 words). 14. Vladimir Skosyrev article headlined "Chinese Navy drifts to capital market" says that China Shipbuilding Industry Corporation plans to raise as much as $1.4 billion from the sale of shares to acquire assets for assembling military ships and features a Russian expert's comment; p 8 (413 words). 15. Yury Paniyev article headlined "Pyongyang restarts reactor" says that according to U.S. experts, North Korea has restarted its nuclear reactor. Meanwhile, the talks on the North Korean nuclear problem are in a deadlock. A Russian expert comments on the problem; p 8 (693 words). 1. Yekaterina Sobol article headlined "Kamenshchik Domodedovo's owner again" says that officials are waiting for documents confirming that Dmitry Kamenshchik is the owner of Moscow's Domodedovo Airport; pp 1, 12 (750 words). 2. Maria Zheleznova article headlined "Putin to receive opposition" says that representatives of the non-systemic opposition, including Alexei Navalny, have been invited to take part in the 10th conference of the Valday discussion club and a meeting with President Vladimir Putin. Navalny, however, rejected the invitation; pp 1-2 (800 words). 3. 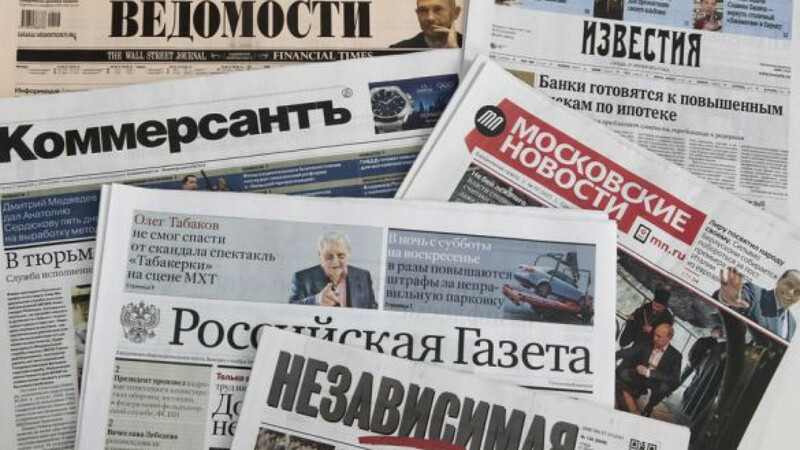 Editorial headlined "Stability spent" says that the authorities are preoccupied with the discussion of how to regulate consumer crediting which has reached quite a large scale in Russia; pp 1, 6 (550 words). 4. Timofei Dzyadko article headlined "To sue Sechin" says that TNK-BP's minority shareholder Gennady Osorgin has complained to the Russian Union of Industrialists and Entrepreneurs that Rosneft's head Igor Sechin did not comply with corporate ethics and demanded that Sechin be sued; p 10 (519 words). 5. Mikhail Minakov article headlined "Philosophy of freedom: West and post-Soviet subconsciousness" comments on Putin's article in The New York Times newspaper where he warned about the danger a military operation against Syria is fraught with; p 7 (676 words). 6. Polina Khimshiashvili article headlined "Syria's friends going to Bishkek" says that the Syrian issue will definitely overshadow the SCO's economic development at the organization's summit in Bishkek; p 2 (454 words). 7. Editorial headlined "Stock indicator" looks at new criteria of assessment of the quality of education and efficiency of higher education institutions proposed by the Education and Science Ministry; p 6 (268 words). 8. Yekaterina Shulman report "People's lawmaking" says that protest leader Alexei Navalny, who came in second in the mayoral election in Moscow, intends to table with the Moscow city duma six bills; p 7 (850 words). 1. Nadezhda Yermolayeva article headlined "Chance for peace" gives highlights from Putin's article in The New York Times; pp 1, 8 (750 words). 2. Olga Ignatova and Lyubov Protsenko article headlined "Moscow sets pace" looks at Sergei Sobyanin's inauguration as Moscow mayor; p 2 (850 words). 3. Dmitry Mezentsev article headlined "We are open to dialogue" looks ahead at the SCO summit to open in Bishkek today; p 3 (1,500 words). 4. State Duma member Vasily Likhachev article headlined "Two faces of the U.S." says that the international community should influence political initiatives of the United States; p 5 (150 words). 5. Galina Bryntseva article headlined "Second-hand child" says that Reuters journalists have exposed an illegal network enabling U.S. parents to exchange or get rid of adopted children; p 7 (900 words). 6. Yury Gavrilov article headlined "Aerodrome becomes invisible" says that chemists have managed to hide an aerodrome from radars during military drills in the Southern Military District; p 7 (300 words). 7. Nadezhda Yermolayeva and Ariadna Rokossovskaya article headlined "Striving for glory?" says that Norway, Sweden and Poland have claimed that the idea to place Syrian chemical weapons under international control was theirs; p 8 (600 words). 8. Yevgeny Shestakov article headlined "Damascus asks balance" says that the Russian and U.S. foreign ministers are discussing the placement of Syrian chemical weapons under international control in Geneva and looks at what may hamper the fulfilment of the initiative; p 8 (1,300 words). 1. Petr Kozlov and Natalya Bashlykova article headlined "Murtaza Rakhimov's man to represent Bashkortostan in Federation Council" looks at the most probable candidate to replace the incumbent senator from the republic, Rudik Iskuzhin; pp 1-2 (900 words). 2. Dina Ushakova article headlined "Alexei Kudrin seeks investment potential in Investigative Committee" says that head of the Civil Initiatives Committee, former Finance Minister Alexei Kudrin, has expressed concern over the negative effect that law enforcement agencies have on the investment climate in the country; pp 1, 3 (368 words). 3. Viktor Loginov report "Putin instructs mobile operators and TV channels to reach compromise" says that Putin, Communications and Press Minister Nikolai Nikiforov, shareholders of big mobile telephone companies and television channels have held a meeting to discuss use of frequencies; p 1 (450 words). 4. Denis Telmanov article headlined "Manufacturers to be held accountable for Bulava" says that a state commission investigating the failed launch of the Bulava missile on Sept. 6 is to begin a large-scale audit of the companies that manufactured the missile; p 2 (536 words). 5. Ivan Cheberko report "Fault of rocket discovered on ground" says that malfunction has been revealed in the Proton-M rocket. Its launch with an Astra 2E satellite scheduled for Sept. 17 has been postponed; p 5 (550 words). 6. Lyudmila Podobedova article headlined "Igor Sechin not to leave Belarus without oil" says that Russian oil companies are unlikely to significantly reduce oil supplies to Belarus, which has been voiced as a threat in retaliation to the arrest of Uralkali's CEO in Minsk; p 6 (1,014 words). 7. German Petelin and Yelizaveta Mayetnaya article headlined "Diplomat in Abkhazia may have been killed over $35 million" looks at new theories of the murder of Russian diplomat Dmitry Vishernev in Abkhazia; p 6 (906 words). 8. Konstantin Volkov interview with the deputy secretary-general of the UN, head of the UN Office on Drugs and Crime, Yury Fedotov, headlined "'Europe switches to cocaine'" where he talks on how revolutions and wars in the Middle East, North Africa and Mali have boosted drug trafficking; p 7 (1,199 words). 9. Maria Gorkovskaya and Igor Yavlyansky article headlined "General Al-Sisi being prepared to become Egyptian president" says that head of the Supreme Council of the Armed Forces General Abd-al-Fattah al-Sisi has unofficially started a presidential election campaign; p 7 (661 words). 10. Natalya Demchenko article headlined "Why it is important for Russia to maintain its reputation" contemplates why it is crucial for Russia to persist with its stance on the Syrian conflict; p 9 (698 words). 11. Maxim Kononenko article headlined "End of the way" comments on the UN report on migration where Russia ranks second in the rating of countries with the biggest number of migrants; p 9 (807 words). 1. Natalya Rozhkova article headlined "Navalny's lawsuits thrown into lorry" says that Alexei Navalny has filed 951 suits demanding that the results of the Moscow mayoral election be annulled and says that but for the ruined ballot papers, the second round was inevitable; pp 1-2 (534 words). 2. Konstantin Smirnov report "Interpol not looking for Kerimov, so far" says that Interpol has denied that it put Russian businessman Suleiman Kerimov on the wanted list; p 2 (550 words). 3. Pundit Vladislav Inozemtsev report "Until leaders go" says that Russia is in need of "normal political parties"; p 3 (1,100 words). 4. Mikhail Zubov article "Nemtsov may be deprived of deputy mandate" interviews opposition politician Boris Nemtsov who says that he may lose a mandate of a Yaroslavl Region duma deputy; p 4 (500 words). 5. Melor Sturua article headlined "Putin outshines Obama" comments on Putin's article in The New York Times and looks at how Russia's proposal to place Syrian chemical weapons under international control has affected the alignment of forces in the world; p 16 (1,241 words). 1. Political analyst Konstantin Simonov article headlined "Return of elections" looks at the outcome of the Sept. 8 elections in Russia and speculates on the prospects of co-operation between the Russian authorities and the opposition; p 10 (1,000 words). 2. Irek Murtazin article headlined "Complainant runs away" says the Moscow city court has upheld the sentence of 150 hours of public works handed down to banker and media magnate Alexander Lebedev by a lower court for punching fellow tycoon Sergei Polonsky during a TV talk show; p 5 (800 words). 1. Alexander Litoy article headlined "Syria and unity" features experts' comments on a possible agenda of the upcoming forum of the Valday political discussion club; pp 1-2 (600 words). 1. Alexander Dmitryev article headlined "In a neighborly spirit, speaking clearly" says Rosneft head Igor Sechin might become a supervisor of economic relations between Russia and Belarus; pp 1, 3 (900 words). 2. Sergei Frolov article headlined "Changes at information front" comments on President Vladimir Putin's article on Syria which was published in The New York Times newspaper on Sept. 12 and says Russian leader has managed to "find words that have woken up America"; p 2 (900 words). 1. Viktor Ruchkin article headlined "Not to miss a chance of peace in Syria" analyzes President Vladimir Putin's article on Syria in The New York Times; p 3 (600 words). 2. Anna Potekhina article headlined "They become relatives in Ashuluk" reports on the Combat Commonwealth exercise at the Ashuluk training ground in the Astrakhan region; p 5 (700 words). 3. Anna Potekhina article headlined "Abkhaz Rubicon: five years later" reports on everyday life in the breakaway Georgian region Abkhazia on the fifth anniversary of Russia's recognition of independence of Abkhazia and South Ossetia; pp 12-13 (2,100 words). 1. Yelena Krivyakina article headlined "'Protest vote not against Sobyanin but against officials' abuse of power'" looks at the inauguration ceremony of the elected Mayor Sergei Sobyanin; p 2 (600 words). 2. Dmitry Smirnov article "'God created us equal'" says President Vladimir Putin has directly appealed to the U.S. public in his article in the New York Times; p 2 (400 words). 1. Anton Stepanov article "Give the world a chance" looks at Vladimir Putin's article in the New York Times and says the Russian president has warned the U.S. against military action in Syria; p 2 (350 words).